They say knowledge is power, and that’s especially true when it comes to picking out the right kitchen table for your home. You need all the facts about different table heights so you can shop like a pro. Don’t worry, we’re here to help! In this post, we’re going to be focusing on standard and counter height dining tables and dinette sets. You’ll learn all the specs you need to know to find the perfect table for your space. From material and color to table height and seating, you’re going to be an expert on all our top table sets. The middle ground for dining room sets is a counter height table. It’s not quite tall enough for a bar and it isn’t short like a standard or traditional dining room table. We like counter height tables for many reasons. First, counter height is a great sitting height for adults with long legs. Instead of crouching down at a standard table, counter height is great for sitting and subtly stretching out your legs. We also prefer counter height for eat-in kitchens. The taller table top elongates the height of the room, which also makes the table feel smaller. You don’t want your kitchen table to overcrowd the cooking area. Choose a counter height dining set to give the illusion it takes up less space. A crowd favorite counter height set at American Freight Furniture and Mattress is the Vision 5 Piece Counter Height Set. This multi-toned table and chairs are the perfect balance of spacious and compact. If you have an eat-in kitchen, the Vision is a great choice because it takes up minimal space. We love this set for its minimal design with comfort detailing. The grid chair backs are simple and elegant. The chair cushions are a soft cream fabric. The legs of the table and chairs are a beautiful steel and wood blend. The mix of dark brown, light brown, and cream make this neutral round table set perfect for any kitchen. 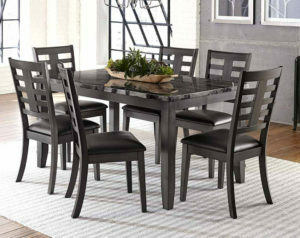 This 5 piece dining table set is only $299! You can take it home today with low easy payments or choose our free layaway option. Visit an American Freight near you for more details. If you’re looking for the perfect light and bright counter height table for your country white kitchen, you won’t want to pass on the Amelia 5 Piece Counter Height Dining Set. Stage this table against a long wall or let it steal the show in your open concept kitchen layout. This two-toned table and chairs set take charming and detailed to the next level. The base of the table and chairs is a beautiful eggshell white. The table top and seat tops are a rich textured hardwood that looks just like beautiful antique or repurposed wood. The criss-cross detailing on the chair backs is simple and sophisticated. 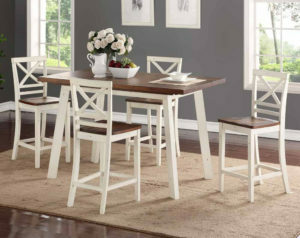 You can bring home the Amelia 5 Piece Counter Height Dining Set for your own kitchen for only $399. Stop by your local American Freight today to learn about how you can take home the complete set for $50! Do you prefer a spacious round table with built-in storage in the base? If so, you’re going to love all the places to tuck decor, kitchen appliances and wine in the Conner 5 Piece Counter Height Dinette. The large dining table set is great for open concept kitchens and dining rooms. The dinette set is a rich espresso color with synthetic leather upholstered seats. The round table top features a lazy susan in the center which is perfect for sharing meals family-style. The table is large enough to sit anywhere from five to eight adults comfortably. 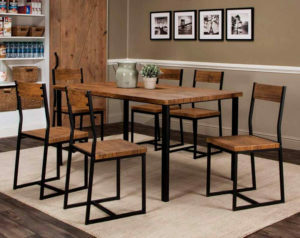 Make the Conner 5 Piece Counter Height Dinette your next kitchen table set for only $699. Ask a store associate how you can take home the beautiful matching upholstered bench for an additional cost. Visit American Freight today to try the Conner dining room table before you buy. From casual, everyday dining to formal gatherings around the holidays, you need a dining room table that can meet your needs all year. American Freight Furniture and Mattress offers a unique selection of the latest dining room styles. No matter if you love a traditional big dining set or a compact minimalistic design, we have something for you. Best of all, our discount furniture prices will help you keep money in your pocket. Most standard height dining room tables are between 28″ and 30″ tall. You might find a 31″ or 32″ tall table here or there, but this range of heights is fairly universal in the U.S. If you’re shopping for a standard height table, these are the measurements to keep an eye out for. Many dinette sets fall into the standard table height range. If you’re looking for a bold and exciting kitchen table to make a statement in your home, check out the Brayden 7 Piece Dining Set. This farmhouse style dining table set is edgy and beautiful. Stage it in your dining room or open concept kitchen. The Brayden is a standard height black table and chair set with light accents. The frame of each chair and the base of the table are a rich black color, but the seat cushions and tabletop are cream and oak colors. We love the contrast in these two tones. The bright oak tabletop is easy to clean and will blend beautifully with wood accents in your kitchen. The cream upholstered cushions are plush, yet firm. The back of the chairs features a simple ladder back design. This standard height dining room set can be yours for only $599. Visit an American Freight near you to test it out for yourself and take it home with same-day delivery! Click here to find a location nearest you. Elevate your dining room with a kitchen table that is classy and affordable. 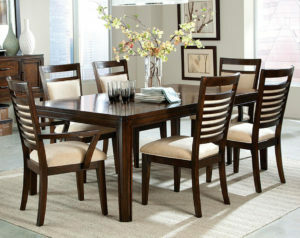 The Canaan 7 Piece Dining Set will give your space an upscale look without breaking the bank. This complete set will sit up to six people comfortably in any dining room area. What we love most about the Canaan dining set is the glossy, high-end appeal. The tabletop is a gorgeous faux grey marble and the seat cushions are a shiny black synthetic leather. All the hardwood is a rich black shade. The chairs feature a ladder back with a vertical center splat. The Canaan 7 Piece Dining Set is one of our top picks for standard height dining tables. Don’t miss the opportunity to bring this set home! The complete dining set is only $599. Sign up for our free layaway option or low easy payments through American First Finance. Visit your local store for more details. Are you looking for a traditional cherry wood table and chairs? The Avion 5 Piece Dinette Set is where modern meets traditional in an exciting way. Use the matching leaf to expand this table for celebrations at home. 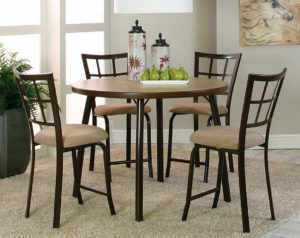 You can also stage this standard height dining set all year in your dining room. The Avion features a cherry wood finish throughout. This kitchen table set comes with four traditional armless chairs. Two armchairs for either head of the table are available for an additional cost. Each chair has a cream upholstered back and seat cushions for luxurious comfort. The table comes with a leaf to expand for any holiday party or special occasion. Stop by your local American Freight Furniture and Mattress today to pick up the Avion 5 Piece Dinette Set. 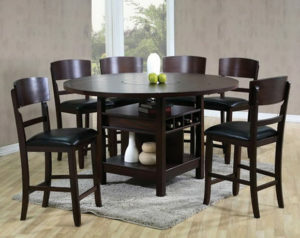 Buy the table and four chairs for just $599 or the complete set with six chairs for only $799. We make it easy to bring home your brand-new kitchen table set with financing options to fit your budget. Your cute and cozy eat-in kitchen can be home to an adorable dinette set or counter height kitchen table, you just need a strategy! First, think about how many people use the table and how often it is used. If your kitchen table will work as half desk, half eating space for two adults, place a rectangular or square counter height dinette up against a wall to save space. If necessary, remove a chair or two that you don’t need access to every day. The next way to save space in an eat-in kitchen is more suitable for families. Take your standard or counter height table and place the shortest side of the table against a wall. Make sure there is ample room the line two chairs on either long side of the table and one at the end, if necessary. If you have the flexibility of an eat-in kitchen and a dining room, there are plenty of ways to utilize your space. For large families, choose a traditional kitchen table at standard or counter height. Give yourself, your kids, and your partner some extra space to move around by staging the table in your dining room. This will also give dinner guests plenty of room to dine with you. If you’d still like a table in your eat-in kitchen, try a pub set or a taller, narrow table that won’t overwhelm the room. For households of three or four, you can get creative with your dining setup. Choose a casual dining table in your eat-in kitchen or bar stools to utilize a high counter. Add a larger table to your dining room for formal occasions or other uses like puzzles, crafts, and more. For your open concept kitchen, you need to make sure your dining sets tie everything together nicely. We love to add a large farmhouse style kitchen table with multiple chairs and a large bench. One large table will connect the spaces between your kitchen and living space effortlessly. Plus, you can utilize as much or as little as your oversized kitchen table as you’d like. Another way to stage your open concept kitchen is to choose a tall kitchen table that acts as part kitchen island part table. Select a large counter height table to use as extra surface space while you cook and entertain guests at the same time. With this option, there are tons of possibilities for color and style options. How Will You Dine Today? Thanks for joining us for a jam-packed post about all things dining sets. From standard table height to counter table height, you have dozens of options for your next kitchen table at American Freight Furniture and Mattress. Check out our latest products here or browse all our dining sets here. Click here to find out which American Freight location is nearest you. We’re always changing inventory, so hurry in while your favorite dinette sets or standard dining room tables are still in stock! Did I mention we offer same-day delivery for all in-stock items? Visit a store near you for more details.